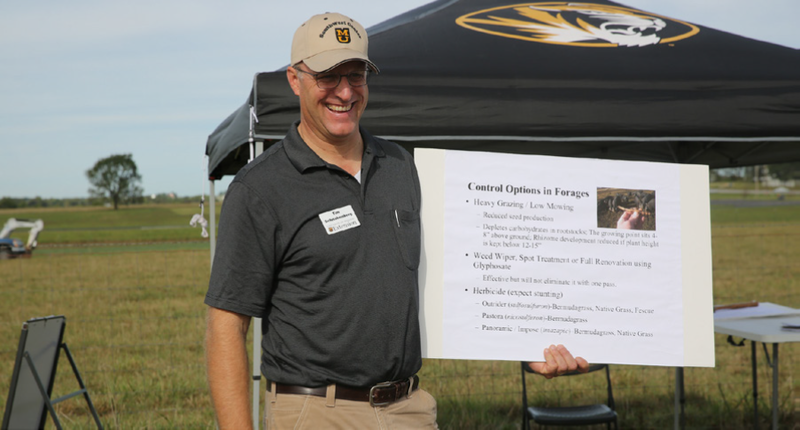 The Southwest Research Center Field Day will be Saturday September 9, 2017 from 9 am to 1 pm. It will include a Beef Tour, Forage Tour, Horticulture Tour, and General Ag Tour. It will feature airplane rides, pumpkin patch, grass maze, face painting and other children's activities. Tim Evans, The value of a veterinary diagnostic laboratory to Missouri agriculture — 9 & 11 a.m.
Eric Bailey, Mineral supplementation for beef cattle — 9:30 & 11:30 a.m.
Jared Decker, Selecting for profit — 10:30 a.m. & 12:30 p.m.
Ryan Lock, Baleage supplementation — 9 & 11:30 a.m.
Tim Schnakenberg, Bermudagrass: could it be a game-changer in our hayfields and pastures? — 9:30 & 11 a.m.
Stacey Hamilton, Measure-monitor — manage your pasture with paddock track: technology to improve your bottom line — 10:30 a.m. & 12:30 p.m.
Patrick Byers, Blackberry research and production — 9:30 & 11 a.m.
Kelly McGowan, Overview of elderflower research — 9:45 & 11:15 a.m.
Grant Bolton, Trapping and control of spotted-wing drosophila — 10 & 11:30 a.m.
Shon Bishop, High tunnels and Brussels sprouts — 9 & 10:30 a.m.
Dean Volenberg — 9:30 & 11:30 a.m.
Leon Riggs, Introduction and history of bees — 9 & 11 a.m.
Rick Rath, Missouri Department of Conservation — 9 & 11 a.m.
David Brune, Sustainable seafood production in the Midwest — 9:30 & 11:30 a.m.